Hair loss, thinning hair or pattern baldness? If you have reached our website it stands a very good chance that you are looking for hair replacement Chester and trying to find out a solution to your hair loss or balding problem. There are many different options when looking for a hair loss clinic Chester – you may have already visited someone local and been offered ‘treatments’ and even maybe surgery of implanting hair into your scalp. We offer something different – hair replacement Chester – there is no surgery involved, a hair system is fitted to your area of baldness and cut and blended with your existing hair – the final results are a full head of hair, any hair style..
Firstly you are best to visit us and book in for a private consultation – we can chat through your concerns and show you how a hair replacement is the answer for you. There is no pressure or sales pitch. If you decided to go ahead then the next stage is getting the right system – we would check hair density, colour and type so that it matches with your existing hair. We do have a certain number of systems in stock – but usually this takes less than 7 days to order and be ready for fitting. If you decided to go for a made to measure this takes approximately 10-12 weeks. This is the final step – and the best bit! – You visit us and we fit, cut and style your new hair. The final results is the most important aspect and this is where we use our expertise and have clients from all over the UK travel to us. We can ensure the final look is undetectable and looks great. Hair replacement Chester can achieve great results. Is it very secure? – YES! Swim & shower? – YES! We are based in Wolverhampton City Centre – so approx 1 hr 30 min drive from Chester. We have clients who travel to us who are looking for a hair loss clinic Chester and from all areas of the UK. We have parking available (for free) at the rear of our salon and are also only a short walk from the main city train station and/or bus depot. Click here for directions to us! I always feel 100% Welcome and am pampered like a Celebrity. 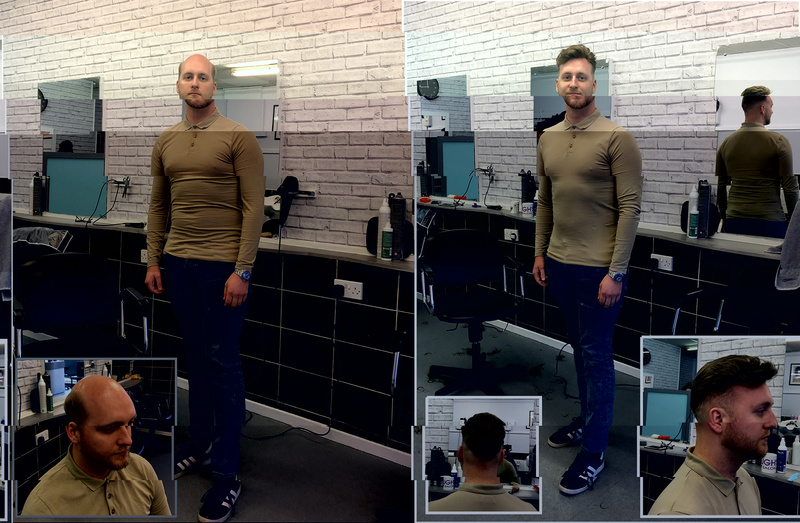 David is a Master Craftsman in his trade and can completely transform anyone into looking fantastic. I enjoy my monthly appointments. We were looking for different options than what the NHS offered when my mom was undergoing chemo and came across Hough's in Wolverhampton. Maggie was very helpful on the phone and we booked a consultation. Cannot thank Maggie enough she was very understanding and the final look is great. Had my new system fitted about 2 weeks now, I actually went for a consultation about 4 months ago and left it until I got the courage to go for the fit - I love the result! Claire was very good and helped me decide on the hair style, certainly would recommend. Reasonably priced. Great staff. Polite and helpful. Found my new regular hair salon. Great staff. Reasonable price range as well. Had a lovely time at this salon, Maggie helped my mom with a hairpiece, made her look 10 years younger, she put her totally at ease. Recommend anyone with hair loss to go here, no need to hide away anymore walk out with confidence wonderful service.